Patty Furguson-Bohnee Patty Ferguson-Bohnee, director of the Indian Legal Clinic, has been chosen 2009 NABA-AZ Member of the Year Award by the Native American Bar Association of Arizona. 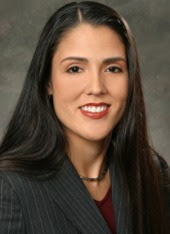 Ferguson-Bohnee was chosen for her “immeasurable” work in both the legal community and the Native American community, including her service as co-founder and vice president of NABA-AZ, her work for the Native community on the Election Protection project, and her recent appointment as vice president of the National NABA. Ferguson-Bohnee will be recognized at the inaugural Seven Generations Awards Dinner from 6-9 p.m. on Saturday, Sept. 26, at the Whirlwind Golf Club on the Gila River Indian Community, 5692 W. North Loop Road in Chandler. Ferguson-Bohnee has substantial experience in Indian law, election law and policy matters, voting rights, and status clarification of tribes. She has testified before the United States Senate Committee on Indian Affairs and the Louisiana State Legislature regarding tribal recognition, and has successfully assisted four Louisiana tribes in obtaining state recognition. She has represented tribal clients in administrative, state, federal, and tribal courts, as well as before state and local governing bodies and proposed revisions to the Real Estate Disclosure Reports to include tribal provisions. She has assisted in complex voting rights litigation on behalf of tribes, and she has drafted state legislative and congressional testimony on behalf of tribes with respect to voting rights’ issues. This entry was posted in Event, Information, NABA-AZ, Professors by Indian Legal Program. Bookmark the permalink.